We would like to share with you the details for the Lunar New Year Special Event part 2! - Details: Log In daily to obtain the Special Rewards for that day! *Bonus reward for logging in 14 consecutive days! ※The event resets every 00:00 PST and you will not be able to receive your log in reward if you do not reconnect. 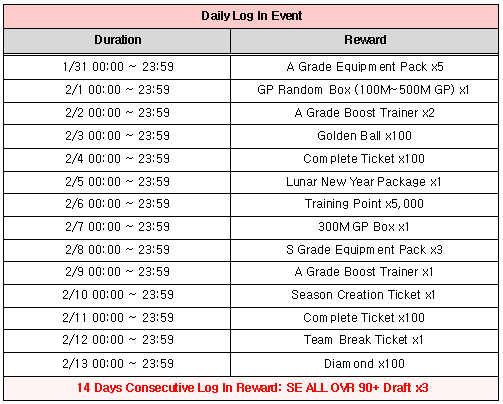 ※Attendance is recognized when the daily login rewards are received, you must have claimed all 14 Daily Log In rewards to qualify for the SE ALL OVR 90+ Draft x3 Bonus Reward. ※Bonus 14 Day Consecutive Log in Reward will be sent to mailboxes within a week after 2/13 Scheduled Maintenance, no later than 2/20. EVENT 2. Boost Success Event (Lv. 6 ~ 10)! - Details: Probability of a Perfect Training Result will be increased by x3! - Details: Increase the Maximum number of Boost Material Players from 10 to 15 during the event period! - Details: GP Cost for Boosting all Players will be discounted by 30% for the event period! - Details: Probability of improving equipment will be x2 for the event duration! - Details: 50% off Training Points when training a player during the event duration! - Details: 50% off when purchasing a draft with Diamonds during the event duration! - Details: Can you guess Who's That Player? Submit your answers on the Form following Maintenance to earn GP! Can we get a buyout event? Definitely need a good buyout event after these past few events. Can someone please explain to me the point of this game? Why boost all players to 10, train all players to perfect, give all players S equipment, all players from the same team, highest badges applied with players ranging from 116 to 138? Why put all this time and effort in when I get destroyed constantly by teams better or worse then myself? I don’t expect to win all the time and wouldn’t want to but losing constantly no matter what team I play is getting to be a joke and extremely unenjoyable, escpecially when losing to a team that isn’t even comparable to mine. My players usually have higher numbers than most but still can’t hit or get shelled when pitching? Is this intentional? If so, I will find a different game to play that is competitive and enjoyable. Seems there will be no buyout again this week from the looks of the Korean forum. Utter disappointment having cards that won’t sell and having to hold on to them for weeks with any buyout event. Guess I’ll contiunue not to spend money to aquire trainers since I don’t have the GP to buy boosting material. Great game model you have going here fellas. My thoughts exactly. Come on gamevil. At least do one of those surprise 24hr buyouts you've done in the past.